If you have bought a television recently, or are considering buying one, take heed: your beautiful new flat-panel TV will try very, very hard to make whatever movies you watch on it look not just bad, but aggressively, satanically, puppy-drowningly bad. TVs are designed to do one thing above all: sell. To do so, they must fight for attention on brightly-lit showroom floors. Manufacturers accomplish this in much the same way that Times Square does — by cranking everything up to eleven. You want brightness? We’ll scald your retinas. You want sharpness? We’ll draw a black outline around everything for you. Like bright colors? We’ll find them even in Casablanca. Oh, and since you associate “yellowing” with age and decay, we’ll also make the image as blue as a retiree’s bouffant on Miami beach. It’s understandable how this comes to be. After looking at the TV store version, the correct version looks positively sad. This is why we don’t taste Pino Noir after drinking a Doctor Pepper, and why you can’t compare TVs in a store. At Best Buy or Costco, you’re not comparing TVs, you’re comparing settings. It’s not just that TVs in stores are too bright, too colorful, and too blue—they are clawing over one another to display the brightest, bluest, and most saturated image on a wall of 300 competitors. At home, you don’t have 300 other TVs to compare yours against, so you won’t suffer from your natural inclination to gravitate toward the most candy-coated images. At home, you’ll be delighted with Inception looking exactly as intended. But, chances are, you won’t be seeing that, because the default settings are wrong. Fortunately, you probably won’t be seeing the hyper-colorful showroom version either. Most reputable manufacturers want Energy Star approval on their flatscreens, and part of that certification means that the sets cannot come off the truck in “demo mode,” also known as “torch mode.” You may be presented with a choice when you first power up the set: demo mode or something like “home” mode. Pick “home” mode and your default settings will be somewhat tamer than the “hey, look at me” showroom floor configuration. And that, right there, is as far as 95% of TV owners will ever go toward “calibrating” their TVs. More than ever, this is a tragedy. Most TVs have some preset modes deigned for different uses. There’s often a “Cinema” or “Movie” picture mode. Use it. It’s the best, easiest shortcut to setting up your new TV to be as inoffensive as possible. These modes will be quite subdued compared to the amped-up default settings, so chances are, when you first switch them on, you’ll experience a bit of that “wow, that sure is yellow” sensation that you get when you look back to the correct Inception frame after staring at the torch-mode one for a minute. Don’t worry, this will pass almost immediately. First, let’s talk about LCD technology versus plasma. Most TVs these days are LCD. Some manufacturers have completely phased out plasma. Why? Because while plasmas look better than LCDs in your home, they don’t win the brighter-bluer battle on the showroom floor. Pause for a moment to reflect on this tragedy—this battle of who can make the most egregiously wrong image has actually caused a superior technology to fall out of favor with manufacturers. Plasmas lost by making movies look they way they’re supposed to. How exactly is plasma superior? For the time being anyway, plasma TVs can render much darker black levels than even the best LCDs. This is the single most important factor affecting image quality in the home, where you are likely to watch movies with at least some of the lights off. It’s also something you just plain cannot judge in a brightly-lit store. It’s worth stating again: If you are TV shopping, just about the worst thing you can do is go look at TVs in a store. Plasma sets also tend to have superior viewing angles. This means that they look good from a broader array of seating positions. LCDs tend to have a “sweet spot”—they can look fine for whomever is seated right in front of them, but the image quality degrades rapidly as you move off-axis—and that’s both side-to-side and up-and-down. But my personal favorite thing about plasma TVs is that they usually don’t have a feature common in LCD sets: motion smoothing. This “feature,” which goes by different names, is associated with sets that tout “120Hz” or “240Hz.” Those are refresh rates, and LCD sets need to tout fast refresh rates, because in the early days of LCDs, they suffered from poor, smeary motion rendering. Those days are gone, and a modern LCD is perfectly capable of displaying 60 clean images per second, which is perfect for NTSC video. Now I’m going to do that internet-unfriendly thing I try to do every so often, which is make a nuanced point. A 120Hz or 240Hz refresh rate is not inherently a bad thing. In fact, they can be good. Both are multiples of 24, where 60 is not. A 60Hz TV, such as a CRT, must display 24p material using an alternating cadence known as 3:2 pulldown. Every other frame is shown for slightly longer or shorter than the previous (2/60ths of a second, then 3/60ths, then 2, then 3, and so on). We don’t tend to notice this, but it is hardly the same as seeing each frame for precicely 1/24th of a second. 120Hz and 240Hz TVs have the potential to show you each 24p frame for exactly 1/24th of a second, perfectly replicating The Way Movies Look, and that’s great. The problem is, it’s hard to make them do that, because of awful motion-smoothing settings that are On by default. Manufacturers somehow decided that The Way Movies Look is bad, and that they should “fix” this using technology. The same technology that is used in software like Twixtor and Kronos to change frame rates of video. Why show a mere 24 frames per second when we can magically build, or interpolate, new in-between frames and show 120 or even 240 frames per second? You’ve seen this. It’s in every store. A big, bright, blue LCD set blasting Avatar. The image is so smooth and “live” looking, you catch yourself trying to figure out if it’s the game or the movie. Or it’s some classic film, playing big and bright and smooth and causing you to wonder if you’re somehow seeing the EPK “behind the scenes” video instead of the actual movie. Filmmakers were not content to make movies with video cameras until those cameras could shoot 24p, because video, with its many-frames-per-second, looks like reality, like the evening news, like a live broadcast or a daytime soap opera; whereas 24p film, by showing us less, looks somehow larger than life, like a dream, like a story being told rather than an event being documented. This seemingly technical issue turns out to have an enormous emotional effect on the viewer. These days, any TV you are likely to buy, will, by default, have technology enabled that completely changes the emotional quality of the movies you watch. This is a cinematic disaster. But again, let me try to restate my nuanced point: The fact that these TVs refresh at 120Hz or 240Hz is not the problem. It’s the motion smoothing technology, often enabled by default, that destroys the way movies look and renders them as soap operas. And you can turn this off. In a Samsung set, the bedeviling setting is branded as “Auto Motion Plus,” and you can set it to Off in the Picture Options menu under Picture. LG calls it TruMotion, and its found in the Picture menu. Set it to Off. Sharp calls it simply Motion Enhancement, and you turn it Off at Picture Settings → Advanced. Sharp has a mode called “Film Mode” that is good—it recognizes 24p material and displays it correctly. Similarly, Toshiba sets have a “24fps Cinema Mode” that displays film material at a true 24 unadulterated frames per second. Panasonic, despite making the best plasmas available, joins the sad trend with their LCD sets in the form of “Motion Picture Pro 4,” found under Picture → Advanced. Sony (not pictured) calls theirs Motionflow, and it’s in various places on various sets, but easy to find. Turn it, say it with me now, Off. This should be the first thing you do when you buy a new LCD TV. But you should not buy an LCD TV. You should buy a plasma. Remember that plasmas had trouble standing out in showrooms—that what was better about them, and what used to command a higher price than the competition, was impossible to appreciate under bright fluorescents? The result is lower prices. Panasonic plasmas (widely regarded as the best after Pioneer ceded the throne) are dirt cheap these days. Here’s a beautiful 55” model for only $1,150. Whether you buy a plasma, an LCD, or a laser-whizbang-2000™, you can combat the manufacturer’s need to compete for the attention of jaded mall shoppers using a few simple settings. Turn motion smoothing Off and enable the “Cinema” or “Movie” mode, if it exists. But what if you want to take things a step further and actually calibrate your TV to show a correct video image? The great news is that there are some DVD and Blu-ray discs you can buy that walk you through this process, I recommend Digital Video Essentials HD Basics. It’s $18 on Amazon, and worth every penny. Hilariously, Best Buy themselves actually hock an in-home calibration service, indicting their own supernova-bright showrooms in the sales pitch. If you’ve been paying attention, you might ask, “But Stu, now that I know how to turn off motion smoothing, isn’t a 120Hz or 240Hz LCD panel the better choice for the 24p movie lover, since it can display a true 24 frames per second?” The answer is still no, because modern plasma displays, such as the Panasonics I like, detect 24p material and switch their refresh rates to 48Hz, displaying a true 24p. So plasma is still the cinephile’s choice for a flat panel. Now that you’ve stopped your new TV from demolishing cinema in your home, I hope you’ll spread the word. Take your calibration disk over to your friend’s house, or your parents,’ or your friend’s parents’ house and switch this crap off. Movies are beautiful. We need to stop our TVs from ruining them. Panasonic has discontinued their plasma line, so my new recommendation is this model from Samsung. You will have to turn off the Auto Motion Plus, as this default has now infected even plasmas. With Samsung's plasma line now discontinued (I bought one of the last ones! ), my new recommendation is the LG OLED line, which I bought for my studio. 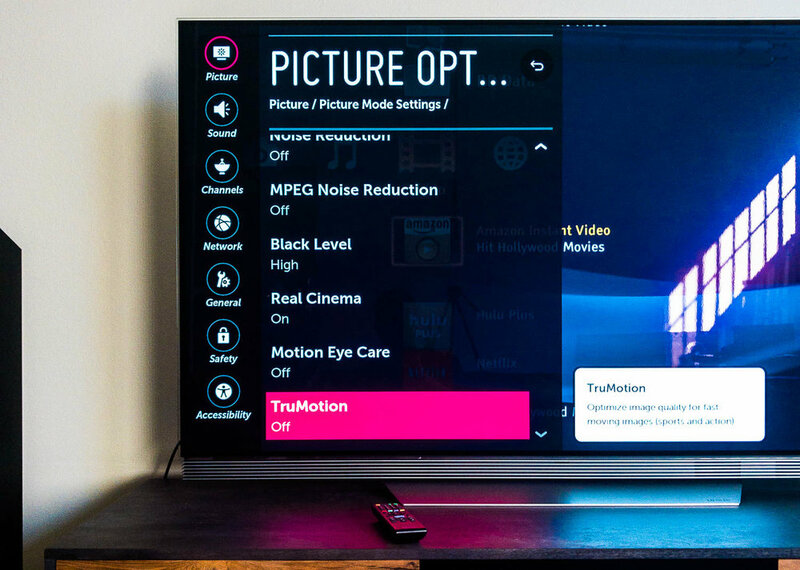 On an LG TV, there are seemingly endless "features" to turn off, but the most important one to kill with fire is called "TruMotion". Leave "Real Cinema" on for the best 24p presentation.